Ultra Tool & Manufacturing has been providing complex metal stamped and fabricated parts and components to the battery industry for 50 years. We’ve established ourselves as a capable supplier in this sector by understanding the specialty materials used in battery production. In addition, we recognize consumer, commercial and military battery manufacturers are working to improve performance, reduce weight and ensure long battery life. We work with all types of materials including; copper, nickel, steel, stainless steel, Kovar, Inconel, 52 alloy, and other nickel alloys. Our parts and components can be found in alkaline, lithium - Ion and nickel batteries in the automotive, aerospace, residential, mass transit, heavy trucking and locomotive industries. Battery components including terminals, topshells, caps, cell tops, cans/covers. 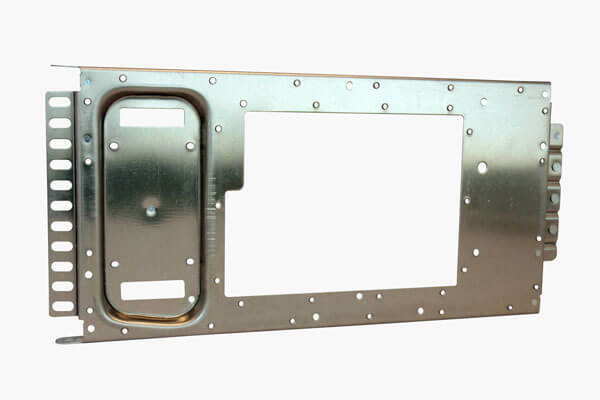 This Manufacturer was encountering increasing costs and difficulty in maintaining accuracy with a two-piece welded aluminum assembly frame with inserted hardware. The company tasked Ultra to develop an inexpensive one-piece design that improved part accuracy and eliminated assembly.